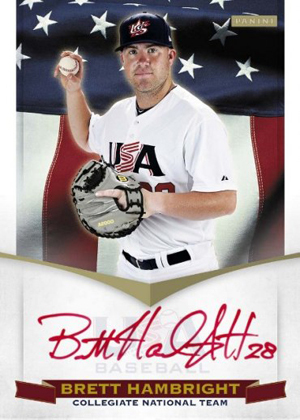 2012 Panini USA Baseball is the company's first dedicated release under their partnership with the national team. The 75-card box highlights the complete rosters of the three USA Baseball squads. The hobby-exclusive release also includes nine hits in every set. Box sets start with a 63-card base set. Every player on the 2012 USA Baseball 15U, 18U and Collegiate teams are included. For members of the 18U and 15U teams, the set has their first Panini cards. Every set also includes three team photo cards that double as checklists. 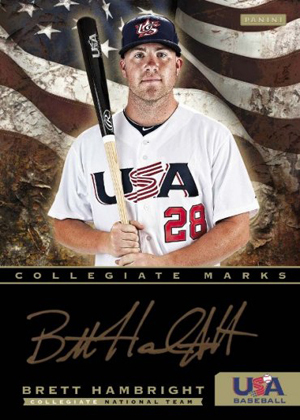 2012 Panini USA Baseball sets deliver seven autographs and a pair of memorabilia cards. This marks the first signature cards from players on the 18U and 15U teams. Members of the Collegiate and 18U teams have on-card autographs. Adding a chase element are ink color variations. Red Inks are numbered to 25. Green Inks have just 2 numbered copies each.Collegiate Marks Autographs, which are numbered to 100, have a black backdrop gold signatures. USA Baseball Lineup Cards have player names cut out from authentic game-used lineups. Cards are also signed by the player and are numbered to 10 or less.